It was just another regular hot summer's day for a bunch of cyclists who went out for a ride in Adelaide, Australia. Until they met a koala looking for a drink! 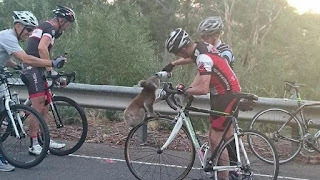 Australian Woman's Weekly has reported that a group of cyclists who had stopped for a drink were amazed to see the koala climbing up the wheel of one of their bikes and perching there until the rider gave her every last drop in their water bottle. 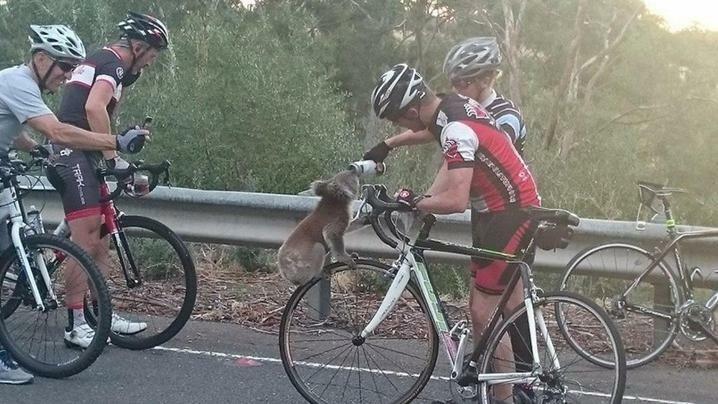 Fellow cyclist Nick Lothian, snapped the picture above, explaining that the koala chilled out on the bike for half an hour. The group named the fluffy marsupial Carolina and took her to animal welfare officers to check if she had kidney problems, which could have explained the thirst. Thankfully, the tests came back all clear and Carolina was sent back into the wild.